On September 17th, HWPL, an international peace NGO registered in UN ECOSOC and UN DPI, opened the first day of “2018 HWPL Peace Summit” in Incheon, South Korea, in attendance with about 600 social representatives various sectors in the world. 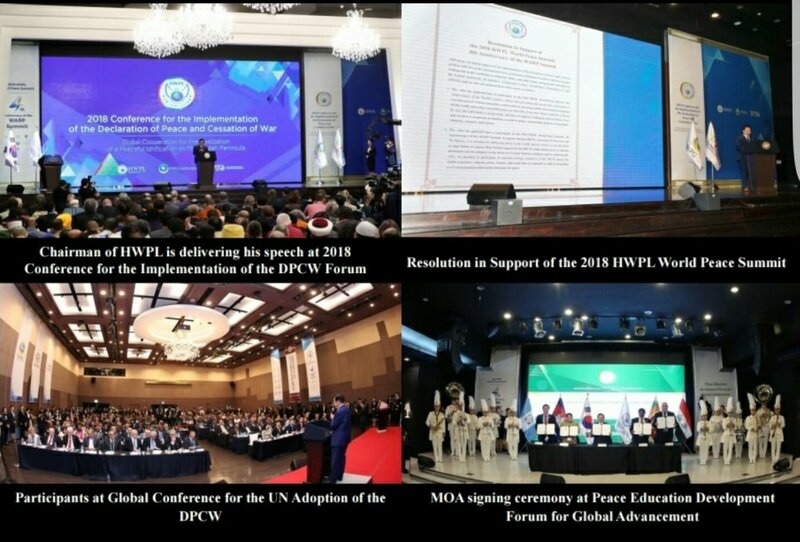 At the plenary session for the 3-days peace summit, “2018 Conference for the Implementation of the Declaration of Peace and Cessation of War (DPCW)”, HWPL presented the yearly report of its peace initiatives including the enactment of the international law for peace, peaceful approach to unification of the two Koreas, and development of peace culture through peace education. At this session, the national solidarity statement, a statement of agreement in relation to the support of the DPCW at the national level, was also introduced as well as the cases of recent agreement eSwatini, Seychelles, Comoros, and Pan-African Parliament (PAP).​ The session concluded with the announcement of the “Resolution in Support of the 2018 HWPL World Peace Summit” that addresses the cooperation for building a peaceful world transcending the barriers of nation, ethnic, religion, and culture.​ - Scheduled Program for the 2018 HWPL Peace Summit on September 17th - Title Date and Time Note Press Conference for the 2018 HWPL World Peace Summit: 4th Anniversary of the WARP Summit September 17th, 2018, 09:00~10:00 120 Journalists 32 countries participate in the conference. HWPL Intercontinental WARP Office Meeting September 17th, 2018, 10:00~12:00 Religious leaders discuss “What Religious Texts Tell You ‘Afterlife’”. Peace Education Development Forum for Global Advancement September 17th, 2018, 10:00~13:20 Introduction of peace education at the national level will be discussed. 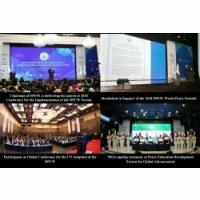 Global Conference for the UN Adoption of the DPCW September 17th, 2018, 11:00~13:35 Expanding support for the DPCW at the national level will be discussed. 2018 Conference for the Implementation of the Declaration of Peace and Cessation of War September 17th, 2018, 15:30~18:00 Global cooperation for global peace and peaceful unification on the Korean Peninsula will be discussed. Please visit http://www.warpsummit.org/en/ for more information.